Explanation: (xxxedit and linkxxx) Hurtling through space above the Red Planet, potato-shaped Phobos completes an orbit of Mars in less than eight hours. In fact, since its orbital period is shorter than the planet's rotation period, Mars-based observers see Phobos rise in the west and set in the east - traveling from horizon to horizon in about 5 1/2 hours. 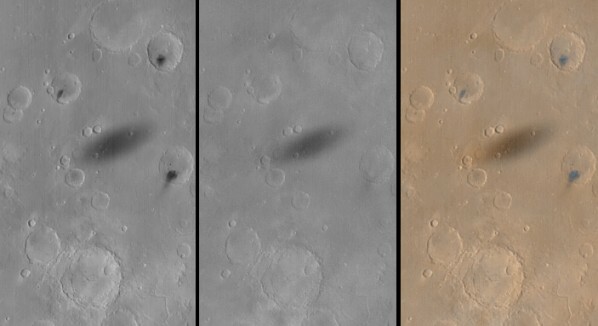 These three images from the Mars Global Surveyor (MGS) spacecraft record the oval shadow of Phobos racing over western Xanthe Terra on August 26, 1999. The area imaged is about 250 kilometers across and is seen in panels from left to right as red filter, blue filter, and combined color composite views from the MGS wide-angle camera system. The three dark spots most easily seen in the red filter image are likely small fields of dark sand dunes on crater floors. 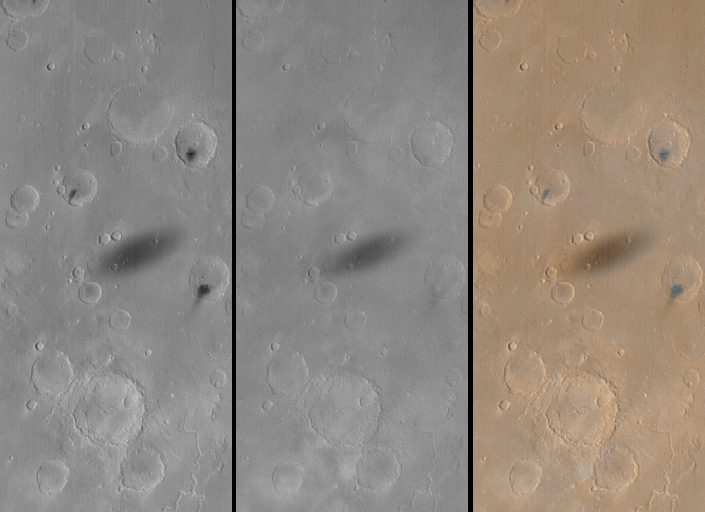 Standing in the shadow of Phobos, you would see the Martian version of a solar eclipse!